Four companies from the KBA Group will showcase a selection from their range of solutions at this year's interpack in Düsseldorf, Germany. KBA-Metronic will unveil code-M, a software that enables centralised administration of print jobs, monitoring of entire marking lines and the integration of camera control systems. With the software, data module, data from databases can be inserted into printed texts. Code-M data and code-M editor modules are claimed to help in creating complex text layouts. KBA-Metronic will also present betaJET xenio tried and tested DOD inkjet system. The product portfolio includes thermal, inkjet, laser and combined printer units and it claims to cover present market requirements. KBA-Sheetfed will showcase its digital sheet-fed press KBA VariJET 106 for folding box printing. The VariJET integrates traditional printing and finishing technologies with digital inkjet printing. Regional and campaign-specific versions of packages, value added and infotainment packages along with database-aided sales campaigns are also supported. KBA-Flexotecnica shall showcase its migration-free printing with water-based inks which can be useful in food packaging. The laminating machine EVOLAM will allow the use of solvent-free adhesives. At the expo, KBA-Kammann will showcase decoration solutions for hollow bodies made from glass, plastic and metal. The systems are claimed to be allowing for optimum configuration of applications to meet diverse requirements of customers in several markets. 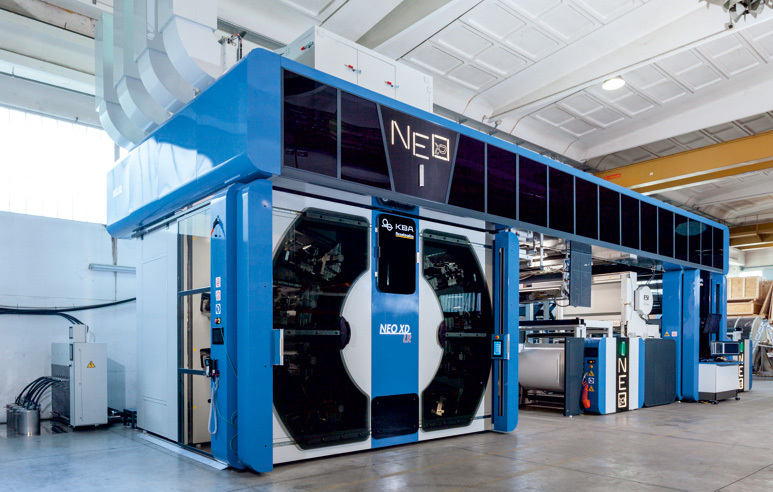 Image: NEO XD LR CI rotary press from KBA-Flexotecnica. Photo: Courtesy of Koenig & Bauer AG.